These Double Six Dominoes Sets feature black, red, or white tiles with spinners. 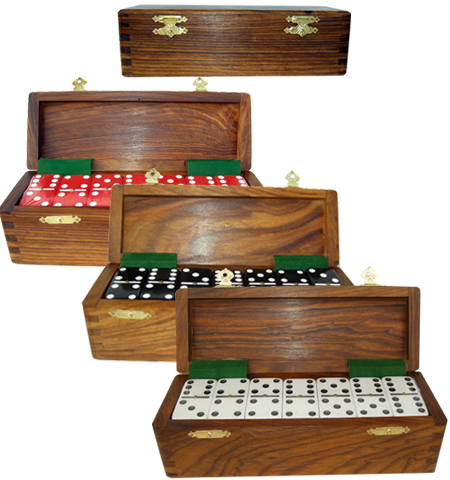 Each Dominoes Set comes packaged in a sturdy walnut stained wooden box with two gold colored clasps that secure the lid. The Domino Tiles measure 2" X 1" X 1/2"
For additional information on any of our Dominoes Sets, please contact us at 1-800-233-0828. You might also be interested in our other Dominoes Sets, including our popular Tournament Dominoes Sets in Black Velvet Boxes.